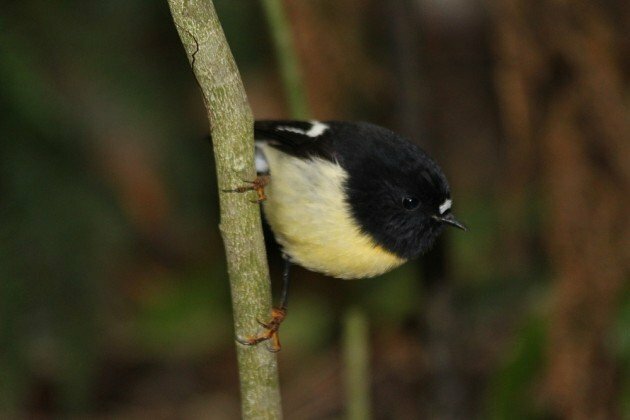 As I said last week, I’ve decided to try and knock off a few of the New Zealand endemics and specialities that I haven’t seen before over the coming year, and the first place that sprung to mind was pretty close, just across the Cook Strait in the Marlborough Sounds. I’ve been to the Sounds before, but I had never visited them specifically to bird, which means I hadn’t seen the specialities there. This trip was to rectify that. 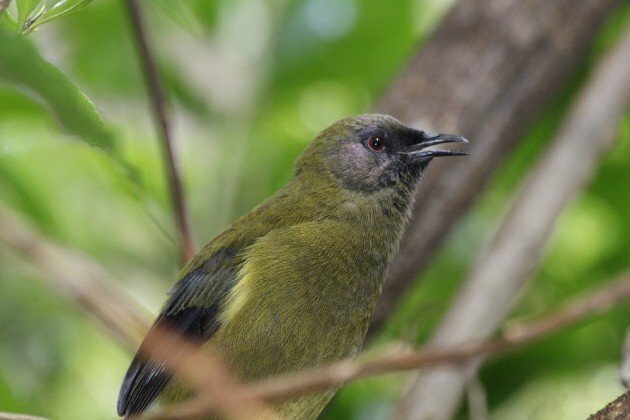 I took a tour out of Picton with Eko-Tours – who are pretty much the only outfit birders can use, so it’s just as well they do it well. I went out with the morning sunrise tour and then came back with the wildlife tour in the afternoon, something they are prepared to do for birders who want to spend time on Blumine Island (if both tours are going anyway). So early in the morning we left Picton and headed out along Queen Charlotte Sound, getting the general tour and occasionally stopping to look at whatever we found. In the early morning out on the water there were plenty of Fluttering Shearwaters and Australasian Gannets, and close to a salmon farm we found New Zealand Fur Seals as well as Pied Shags, Little Shags and Spotted Shags (I can only assume that kiwis just like calling all cormorants shags because they are all five years old). Then came Blumine Island, and my number one target for the day. 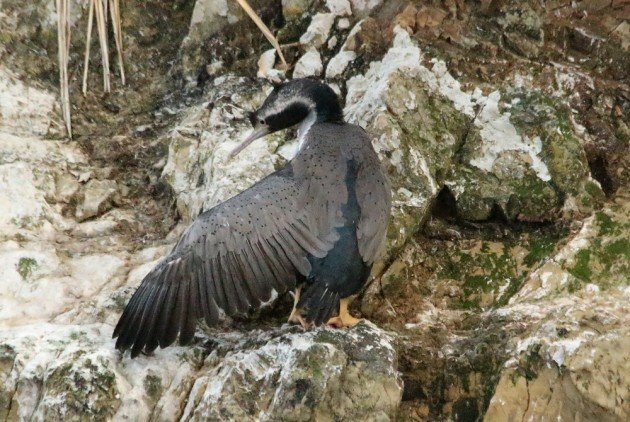 Marlborough Sounds has a pretty special endemic, the King Shag, a species that isn’t just endemic to New Zealand but endemic to just the Sounds. Actually, New Zealand has a couple of highly restricted endemic shags, but this was the one I came for here. 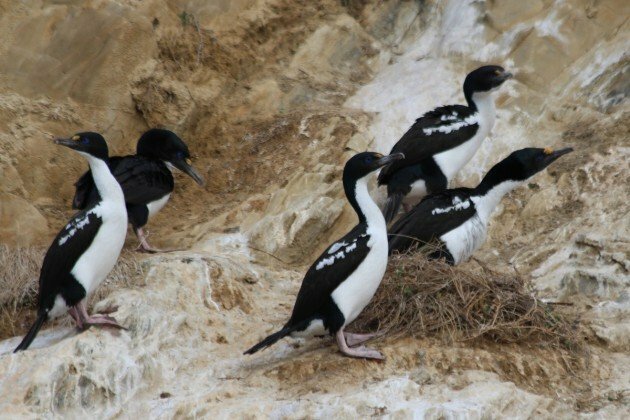 It is the most northerly of the blue-eyed shags found in New Zealand – cormorant taxonomy is fairly confusing but the blue-eyed shags, sometimes placed in the genus Leucocarbo are found around Antarctica and the sub-Antarctic islands. The King Shag has a small population breeding on four protected islands in the Sounds and a small number regularly roost on on Blumine Island (and have even been nesting recently, perhaps successfully), and sure enough they were there and we were able to admire them. King Shags, one with a nest! From there we travelled around the island a bit and then another fellow birder Alan and I were dropped on the beach on Blumine. The reason Alan had come was to film another endemic, a critically endangered species, the Orange-fronted Parakeet. 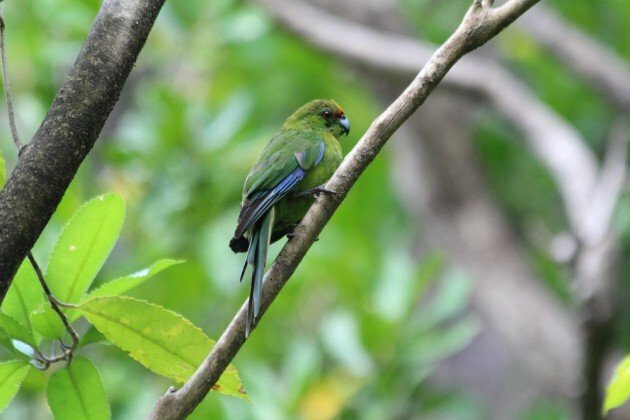 These species is known as the Malherbe’s Parakeet elsewhere in the world because there is another species called the Orange-fronted Parakeet and according to the IOC World Bird List rules, if two species have the same name and one of those species is from New Zealand then the New Zealand species automatically loses. Actually, even if no other species has that name the New Zealand species loses too (the IOC have no other King Shag but call it the New Zealand King Shag, because f**k New Zealand, that’s why). Anyway, this is my article so it’s the Orange-fronted Parakeet. It’s unbelievably rare and came perilously close to extinction, in no small part because people didn’t even think it was a species until recently, and assumed it was a colour-morph of another species. But survive it did and now the Department of Conservation is setting up populations on predator-free islands, the most accessible of which is Blumine. Apparently on pair nests near the landing beach, so they are reasonably reliable. I didn’t see one, probably. I saw a flash that may have been one. Alan did, and I certainly heard them, so they are around, and that’s fine. They are breeding and expanding on the island and I can go back one day and know I have a chance of seeing them then. 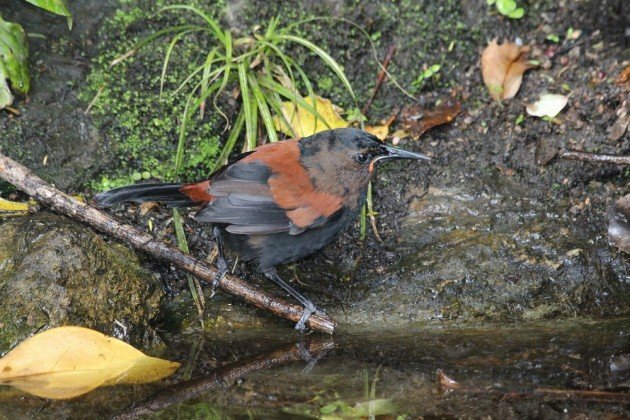 But Blumine was a pretty place to spend a few hours looking for birds, including flightless Weka, some stunning and very tame Tomtits (South Island subspecies, which is prettier than the North Island race) and a huge number of Bellbirds. Also present was another lifer for me, the South Island Saddleback. They have a story of their own, but one for another week. 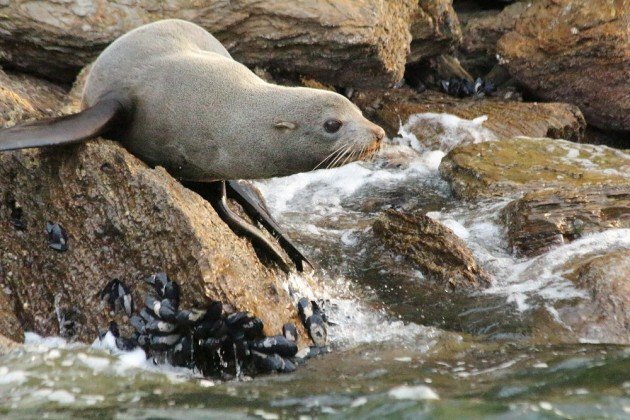 Our pick-up from Blumine was slightly delayed as the afternoon boat was distracted by Bottlenose Dolphins (something I have to say we might have enjoyed ourselves) but we were then off to Motuara Island, another predator free bird sanctuary. This one had a path up to the summit, where Captain Cook formally nicked New Zealand for the British, and most of the tourists went up, but a few of us stayed near the bottom at a birdbath that was the only source of fresh water on the island. 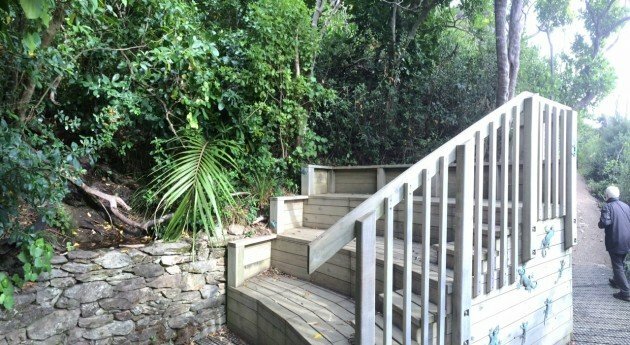 They have built a small theatre around the bath, and sitting there quietly for 30 mins of so we were treated to a show as South Island Robins, Bellbirds, South Island Saddleback and New Zealand Fantails came for a drink. We were also visited by Yellow-crowned Parakeets, another kakariki and one I haven’t seen alive for years. I say alive as this was one of my study species and I worked with the skins for years, so it was a real treat to see them alive. 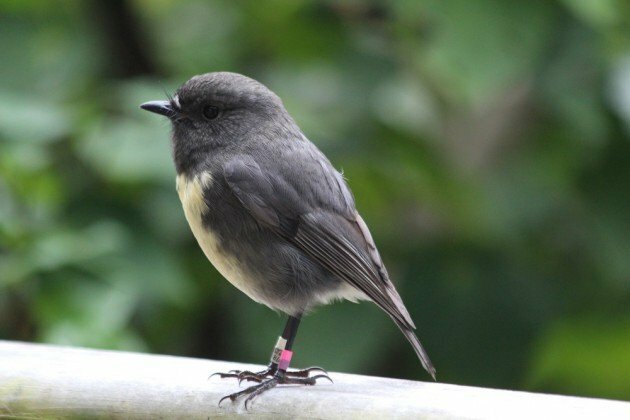 A colour-banded South Island Robin. All in all a good haul of South Island endemics and a lovely day spent in some lovely surroundings. And convenient insofar as you can go out from one of New Zealand’s major transport hubs – Picton is the connection between North and South Island. So what are you waiting for? 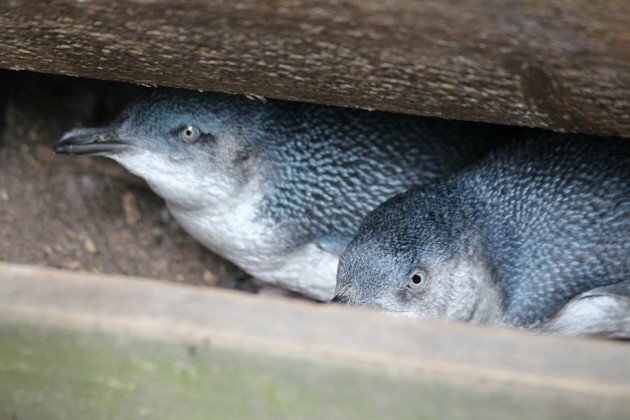 One last surprise on Motuara island were some Blue Penguins! Now you are officially a Kiwi it is great you can add some more Kiwi birds to your life list and so close to home too! Looks like a great day out. Very cool, will definitely get there one day soon, thanks. What is the State Bird of Alaska?